Until recently, only a few microsatellites have been available for Cucurbita, thus their development is highly desirable. The Austrian oil-pumpkin variety Gleisdorfer Ölkürbis (C. pepo subsp. pepo) and the C. moschata cultivar Soler (Puerto Rico) were used for SSR development. SSR-enriched partial genomic libraries were established and 2,400 clones were sequenced. Of these 1,058 (44%) contained an SSR at least four repeats long. Primers were designed for 532 SSRs; 500 primer pairs produced fragments of expected size. Of these, 405 (81%) amplified polymorphic fragments in a set of 12 genotypes: three C. moschata, one C. ecuadorensis, and eight C. pepo representing all eight cultivar groups. On an average, C. pepo and C. moschata produced 3.3 alleles per primer pair, showing high inter-species transferability. There were 187 SSR markers detecting polymorphism between the USA oil-pumpkin variety “Lady Godiva” (O5) and the Italian crookneck variety “Bianco Friulano” (CN), which are the parents of our previous F2 mapping population. It has been used to construct the first published C. pepo map, containing mainly RAPD and AFLP markers. Now the updated map comprises 178 SSRs, 244 AFLPs, 230 RAPDs, five SCARs, and two morphological traits (h and B). It contains 20 linkage groups with a map density of 2.9 cM. The observed genome coverage (Co) is 86.8%. The online version of this article (doi: 10.1007/s00122-008-0750-2) contains supplementary material, which is available to authorized users. The genus Cucurbita (2n = 2x = 40) contains some of the earliest domesticated plant species (Smith 1997; Piperno and Stothert 2003). Today, three of them, C. pepo L., C. moschata Duchesne, and C. maxima Duchesne, are economically important crops worldwide (Robinson and Decker-Walters 1997; Loy 2004). Pumpkin seed oil and pumpkin seed extract are increasingly esteemed for their excellent nutritional quality and medicinal value, especially in the prevention and treatment of benign prostate hyperplasia (Blumenthal et al. 1998; Kreuter 2000; Schmidlin and Kreuter 2003). The recent increase in the popularity of pumpkin has stimulated the breeding of new cultivars. A devastating epidemic of Zucchini Yellow Mosaic Virus (ZYMV) in 1997, destroying half of the pumpkin harvest in Austria, made development of resistant varieties crucial (Pachner and Lelley 2004). A genetic map facilitates marker-assisted selection (MAS) speeding up the breeding process, it is crucial for future structural and functional genomic studies in Cucurbita. Until now only three genetic maps of Cucurbita have been constructed: two maps from inter-specific crosses between C. pepo and C. moschata (Lee et al. 1995; Brown and Myers 2002) and the third from an intraspecific cross of C. pepo (Zraidi et al. 2007). These maps contain only RAPD and AFLP markers. So far, only 27 microsatellites were available for Cucurbita (Stift et al. 2004). Therefore, it was highly desirable to develop a large number of microsatellite markers for constructing an SSR-based map. Microsatellites, also referred to as simple sequence repeats (SSRs), are 1–6 bp long, tandemly repeated sequences. Since microsatellites are abundant in the genome, mostly co-dominant and hyperallelic, they are ideal tools for a broad application in basic and applied plant biology (e.g., Kashi et al. 1997; Gupta and Varshney 2000; Li et al. 2002; Anderson and Lübberstedt 2003; Varshney et al. 2005; Torada et al. 2006; Saha et al. 2006). ESTs are important sources for SSR development in many plants. Unfortunately, only 120 Cucurbita ESTs are available in the gene bank, nine of them including an SSR sequence. Only one of these is suitable for primer design. Nevertheless, partial genomic libraries, enriched for SSRs, can also provide an efficient source for microsatellite development. SSR flanking sequences are often conserved among species and even genera (Katzir et al. 1996; Gaitán-Solís et al. 2002; Saha et al. 2006; Downey and Iezzoni 2000; Yamamoto et al. 2001; Kuleung et al. 2004). Successful SSR transfer between species within a genus has been reported in several genera, for example, Olea (Rallo et al. 2003), Limonium (Palop et al. 2000), Prunus (Wuensch and Hormaza 2002; Dirlewanger et al. 2002), Vitis (Di Gaspero et al. 2000), Pinus (González-Martínez et al. 2004), Triticum (Adonina et al. 2005) and Cucumis (Danin-Poleg et al. 2000, 2001; Ritschel et al. 2004). Of the first 27 Cucurbita SSRs developed from C. pepo (Stift et al. 2004), most were transferable to C. moschata, C. maxima, and C. ecuadorensis. A relatively large set of such highly transferable SSR markers will facilitate the development of an integrated or composite Cucurbita map by merging different maps (Song et al. 2004; Gonzalo et al. 2005). The transferability of SSR markers also will allow comparative genetic studies within this genus and may further elucidate the evolution of the different species in the genus. It might help to shed more light on the hypothetical paleopolyploid origin of the genus (Weeden and Robinson 1986). In this paper we report on the development of a large number of Cucurbita SSR markers and their transferability among species. We have updated our previous C. pepo map, containing only RAPD and AFLP markers (Zraidi et al. 2007), with 178 SSR and 105 new AFLP markers. For microsatellite development genomic DNA was isolated from the Austrian oil-pumpkin variety Gleisdorfer Ölkürbis (C. pepo) and the C. moschata cultivar Soler (Puerto Rico). For assessing microsatellite polymorphism and transferability across species three C. moschata, one C. ecuadorensis, and eight C. pepo genotypes representing the eight cultivar groups (Paris 1986) were used (Table 1). For mapping the previous Pumpkin–Crookneck population was used (Zraidi et al. 2007), consisting of 92 F2 plants. It was derived from an inter-subspecific cross (C. pepo subsp. pepo × C. pepo subsp. ovifera) between the USA oil-pumpkin variety Lady Godiva (O5, ♀) and the Italian crookneck variety Bianco Friulano (CN, ♂). DNA was isolated from fresh young leaves using Promega’s Wizard Genomic DNA Purification Kit (Promega Corp., Madison, USA). DNA concentration was determined by the GenQuant RNA/DNA Calculator (Amersham Biosciences Europe, Germany) according to manufacturer’s protocol. Products of colony PCR were run on 1.5% agarose gel at 90 V for 20 min to screen for inserts longer than 300 bp. PCR products with appropriate size were purified by Exonuclease (ExoI) and Shrimp alkaline phosphatase (SAP) (Fermentas Inc., Ontario, Canada). DYEnamic ET Dye Terminator Kit (GE Healthcare, Uppsala, Sweden) was used for sequencing PCR according to manufacturer’s protocol. Sequencing PCR products were purified with Sephadex G50 (GE Healthcare) in a Multiscreen HTS 96 well plate (Millipore). Sequencing was performed on a MegaBace 1000 DNA analysis system (GE Healthcare). Microsatellite detection was made by the SSRIT program (http://www.gramene.org/gramene/searches/ssrtool). Only sequences containing at least 4 di-, tri-, tetra-, or penta-nucleotide repeats were selected. To identify duplicates sequence comparisons were made using Stand-alone BLAST (2.2.12). Primers were designed with the online software Primer3 (http://frodo.wi.mit.edu/cgi-bin/primer3/primer3_www.cgi) using the following parameters: (1) minimum of seven di-nucleotide or five tri-nucleotide repeats, (2) primer length 18–27 nt, 20 nt considered to be optimal, (3) PCR product size 80–300 bp, (4) optimal annealing temperature 60°C, (5) GC contents from 20 to 80% with 50% as optimum. Primers were synthesized by Invitrogen Corp. CA, USA. SSR primers were first tested using genomic DNA of the respective species. Primers producing fragments were used for polymorphism test. The total volume of the PCR reaction mixture was 10 μl, and contained 27 ng DNA, 2 mM dNTPs, 0.25 units Taq DNA polymerase, and 1× reaction buffer containing 1.5 mM MgCl2 (Gene craft, Germany), 0.25 pmoles forward primer with an M13 tail added to its 5′ end (5′-CCCAGTCACGACGTTG-3′), 2.5 pmoles reverse primer, and 2.25 pmoles fluorescent-labeled M13 tail (FAM, HEX, synthesized by MWG, Ebensburg, D). PCR was performed as follows: denaturation at 95°C for 2 min, followed by seven cycles of 45 s at 94°C, 45 s at 68°C (with each cycle the annealing temp decreases 2°C), and of 60 s at 72°C. Products were subsequently amplified for 30 cycles at 94°C for 45 s, 54°C for 45 s, and 72°C for 60 s, with a final extension at 72°C for 5 min. When primers did not work in this PCR program final annealing temperature was reduced to 48°C. PCR products were separated using 10% polyacrylamide gels, 1× TBE buffer in a C.B.S. electrophoresis chamber (C.B.S. Scientific Inc., Del Mar, CA, USA). Electrophoresis conditions were set at constant 400 V and 10°C for 2 h. Gels were scanned by Typhoon (GE Healthcare, Uppsala, Sweden) in fluorescent mode. where f i is the frequency of the ith allele, and n is the total number of alleles for that locus. A set of 25 EcoRI and MseI selective primer combinations were used to produce AFLP markers for the Pumpkin–Crookneck population (O5 × CN), following the protocol of Hartl et al. (1999) and Buerstmayr et al. (2002). Segregation of each locus was calculated using a chi-square test (P = 0.05). The markers, which showed highly significant segregation distortion (P < 0.001) from the expected 1:2:1 (co-dominant) or 3:1 (dominant) ratio, were excluded from map construction. JoinMap® version 3.0 (Stam 1993; Van Ooijen and Voorrips 2001) was used for linkage analysis and map calculations. Linkage groups were determined using a LOD threshold of 3.0. Map construction was performed, using the Kosambi mapping function with JoinMap parameter settings as follows: Rec = 0.4, LOD = 1.0, Jump = 5. Some of the markers were removed, when they showed insufficient linkage or conflict with others. SSR, SCAR markers and two morphological traits were used to establish a skeleton map first. Then this map was used as “fixed order” to incorporate the AFLPs and RAPDs of the published C. pepo map (Zraidi et al. 2007). The new AFLP markers, produced in this study, were also added to this map. The genetic linkage map was drawn by MapChart software (Voorrips 2002). Genome length (G e) was estimated by “moment estimator”, G e = M(M − 1)X/K (Hulbert et al. 1988), where M is the number of linked markers, X is the maximum observed map distance between the locus pairs above a threshold LOD Z (Chakravarti et al. 1991), and K is the number of locus pairs having LOD values at or above Z. The value used for Z was LOD 3. The values of X and K were obtained from JoinMap using Kosambi mapping functions. The 95% confidence interval (I) of the estimation of genome length was calculated using the equation I = G e/(1 ± 1.96/k −½) (Gerber and Rodolphe 1994). The observed genome coverage (Co) was defined as the ratio of the observed length of the map (G of) and the estimated genome length G e (Cervera et al. 2001). In C. pepo a total of 1,056 clones were sequenced, of which 448 (42.4%) contained an SSR sequence of ≥4 repeats. The remaining 608 clones either contained SSRs with <4 repeats or were cryptic (SSR-similar) sequences. In 59 cases (5.6%) primers could not be designed due to insufficient length of SSR-flanking sequences. One hundred duplicate clones (9.5%) were removed. Ultimately, primers were designed for 230 unique SSR sequences (51.3%) having at least seven repeats of a di-nucleotide, or five repeats of a tri-nucleotide motif (Table 2). In C. moschata 1,344 clones were sequenced, of which 610 clones (45.4%) contained SSRs of ≥4 repeats. In 35 clones (2.6%) the SSR flanking sequences were too short to design primers. Twenty duplicate clones (1.5%) were removed. Finally, primers were designed for 342 unique SSR sequences (56%) with at least seven repeats of di- or five repeats of tri-nucleotide motifs (Table 3). In addition, sequence comparison revealed a cluster of 30 clones, with similar sequences containing 7–18 repeats of the GA/TC motif. Only two of them originated from C. moschata, the rest from C. pepo. Microsatellites were classified by motif and structure. The majority of microsatellites, 68.3% of C. pepo and 74.6% of C. moschata, represented perfect repeats. In both species the majority of di-nucleotide motif was GA/TC, the predominant tri-nucleotide motif was GAA/CTT. Along with the targeted SSR motifs, for which biotinylated oligos have been used, a number of additional motifs were obtained and used for marker production. The average repeat number for perfect GA/TC motif was higher in C. pepo (17.8) than in C. moschata (10.4). In both species the repeat numbers of most GA/TC SSRs ranged from 7 to 11 (55.6% in C. pepo and 69% in C. moschata). However, while in C. pepo 25% of the perfect GA/TC SSRs showed repeat numbers ≥20, in C. moschata only 3.9% were ≥20. All 230 primer pairs developed from C. pepo were initially tested in the Austrian oil-pumpkin variety Gleisdorfer Ölkürbis (C. pepo). Of these, 193 (84%) gave a discrete PCR product with expected size and 19 (8.3%) yielded a complex banding pattern or a smear. The remaining 18 (7.8%) provided no product. All 193 working SSRs were subsequently tested in the 12 genotypes listed in Table 1, and 155 of them (80.3%) showed polymorphism with 2–9 alleles and an average PIC value of 0.62 (Table 2). All 342 primer pairs developed from C. moschata were initially evaluated in the cultivar Soler (Puerto Rico), and 307 (89.8%) amplified PCR products with expected size. Of these, 250 (81.4%) were polymorphic in the 12 genotypes with 2–7 alleles and an average PIC value of 0.65 (Table 3). In both species there were 3.3 alleles per locus on average. In total, 500 new SSR markers were developed, of which 405 showed polymorphism in the 12 genotypes. Transferability of microsatellites across the three species is summarized in Table 4. Altogether 362 SSRs, that is, 76.2% of C. pepo and 70% of C. moschata, could be transferred to C. equadorensis, producing a unique allele in most cases. Transferability between C. pepo and C. moschata was even higher. Of the C. pepo SSRs 88.1% were transferable to C. moschata and 30.1% of them produced multiple alleles in three C. moschata genotypes. Of the C. moschata SSRs 87.3% could be used for C. pepo as well and 50.5% of them produced multiple alleles in the eight C. pepo genotypes. Altogether 187 SSR markers, 94 developed from C. pepo and 93 from C. moschata, were polymorphic between the parents O5 and CN. Seven SSRs showed distorted segregation, but six of them could be mapped. As a first step, these SSR markers along with six SCARs and two morphological traits (h for hull-less seed and B for bush growth habit) were used to construct the skeleton map. This map finally comprises 172 SSRs, two morphological traits and three SCARs. It spans 1008.6 cM and contains 25 linkage groups (not shown). Taking the skeleton map as fixed order, the C. pepo map, published by Zraidi et al. (2007), was updated. Altogether, the new map contains 659 loci: 178 SSR, 244 AFLP, including 105 produced in this experiment, 230 RAPD, five SCAR markers, and two morphological traits (h and B) (S1). A detailed description of the updated map is given in Table 5. Figure 1 shows the map with only the SSR markers. AFLP and RAPD markers are not shown in this map, but map distances occupied by them are included into the distance between the respective two SSR markers. For example, both ends of LGp11 without markers represent the positions of AFLPs and RAPDs; or in LGp8, between SCAR_1476 and CMTm66, the distance is longer than 50 cM because of the hidden AFLP and RAPD markers between them. The complete map is available as supplementary information (S1 in supplement). Out of the five SCAR markers, two were converted from co-dominant AFLP markers, and three were derived from RAPD markers. The map spans 1,936 cM with 20 linkage groups ranging in length from 24 cM in LGp19 to 224.8 cM in LGp3. The total number of markers in individual linkage groups varies from 11 to 53, and the marker density varies from 2.0 to 4.7 cM. On average, one linkage group covers 96.8 cM and contains 33 markers, that is, there was one marker in every 2.9 cM (Table 5). The distribution of SSR markers in the individual linkage groups ranges from 2 to 15 (Fig. 1; Table 5). The estimated genome length (G e) of C. pepo, according to the results of JoinMap, is 2,230.9 cM with the confidence interval between 2,175.6 and 2,288.1 cM. The observed genome map coverage (Co) is 86.8%. The corresponding linkage groups in the published map and in the updated map of this paper are listed in Table 5. The updated map is based on the marker order of the skeleton map as built by JoinMap. The published C. pepo map was created using Mapmaker. In the updated map there were two new linkage groups (LGp18 and LGp19) and each of LGp10, LGp11, LGp14, LGp15, and LGp20 included two linkage groups from the previous published map. Different enrichment technologies significantly increased the efficiency of microsatellite marker development (Kijas et al. 1994; Edwards et al. 1996; Zane et al. 2002). In non-enriched libraries the frequency of fragments containing SSRs may be as low as 0.7%, as was reported by Chiba et al. (2003) for melon. In the process of SSR development, Squirrell et al. (2003) defined the successive loss of sequenced fragments and designed primers, until arriving at a final number of “working SSRs” producing discrete bands of expected size, as “attrition rate”. This is an erosion of the originally high number of sequenced clones to a small final number of working SSRs. The reasons for erosion are (1) the absence of a useful SSR sequence in the clone, (2) duplications, (3) SSR sequences too close to one end of the fragment, and (4) primer pairs that produce either no fragment, or a complex banding pattern, or a smear. In our case this attrition rate was 80.2%, that is, approximately every fifth sequenced clone contained a working SSR. In different Brassica species, using enzyme digestion followed by colony hybridization for enrichment, Lowe et al. (2004) achieved similar enrichment efficiencies. After digesting genomic DNA with restriction enzymes in tall fescue (Festuca arundinacea Schreb. ), Saha et al. (2006) reported 70% of clones containing SSR motifs. However, only every tenth of the sequenced clones produced a working SSR. One major reason for the large difference in efficiency to produce working SSRs in Brassica and Cucurbita, in comparison to tall fescue, may be due to genome complexity. The size of the Cucurbita genome is 1C ~ 0.5 pg DNA, and that of diploid Brassica is slightly higher, 1C between 0.6 and 0.7 pg DNA. In contrast, the genome of tall fescue has 6.1 pg DNA and contains a large amount of repetitive sequences. In plants, the most frequently found SSR motif appears to be GA/TC (Lagercrantz et al. 1993; Li et al. 2002; Morgante et al. 2002; Saha et al. 2006). The genus Cucurbita seems to be no exception; 279, that is, 55.8%, of the 500 working Cucurbita SSRs have the GA/TC motif, but only 6 the CA/GT motif. The GA/TC microsatellite was found most frequently in the 5′ flanking regions of genes in plants (Morgante et al. 2002; Zhang et al. 2004; Li et al. 2004). Song et al. 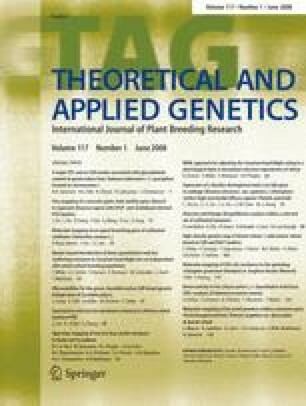 (2005) found SSR markers within 5 cM to known genes in a much higher frequency than would be expected. Thus, GA/TC microsatellites may have a high probability to be linked to important traits. A much higher proportion of perfect GA/TC SSRs having ≥20 repeat units (up to 69) was found in C. pepo than in C. moschata. A further difference between the two species was the presence of a cluster of highly similar sequences with the GA/TC repeat in C. pepo, which was found only twice in C. moschata. Primer pairs designed for 18 members of this cluster produced a smear, suggesting that this sequence was highly repeated in C. pepo, but occurred in a much lower frequency in C. moschata. These structural differences between the genomes of the two species might have arisen by an accelerated evolution of C. pepo after their separation from a common ancestor. The difference could be related, as Linda Wessel-Beaver suggests (personal communication, 2006), to their different use after domestication, before leaving the continent of origin. C. pepo has always been consumed immature, thus selection pressure for earliness might have been strong. On the other hand, C. moschata has been predominantly used as mature fruit, requiring as long as 4 months for ripening. During early cultivation period fruits could even be “stored” in the field and picked as needed. Thus, under tropical conditions in the region where both species originated, C. pepo might have undergone two cycles of selection per year whereas C. moschata had only one. Mutations could accumulate in C. pepo faster than in C. moschata. Within the Cucurbitaceae family, SSR markers developed for the genus Cucumis are generally transferable between cucumber and melon (Danin-Poleg et al. 2000, 2001; Ritschel et al. 2004). However, these markers have a low transferability to Cucurbita (Katzir et al. 1996). To assess genetic relationships in C. pepo, Paris et al. (2003) attempted to apply cucumber and melon SSR markers, described by Katzir et al. (1996) and Danin-Poleg et al. (2001). Seven melon and cucumber SSRs were used; they could, however, only be interpreted as dominant markers. Previously, 102 Cucumis-SSR primers developed by Fazio et al. (2002) were tested for polymorphism in four C. pepo genotypes for mapping (Zraidi et al. 2007). Only a few of these primer pairs generated a band, and none were polymorphic in the tested materials. These results suggest that SSRs are not easily transferable between genera within the Cucurbitaceae. The genomic SSRs developed from C. pepo and C. moschata show a high (~90%) inter-species transferability. The SSR flanking sequences used for primer design are highly conserved, representing orthologous loci in these two species. This suggests a close phylogenetic relationship between the two species, confirming the findings of Sanjur et al. (2002) and Stift et al. (2004). Of the 500 working SSRs, 405 were polymorphic in the set of 12 Cucurbita genotypes. Most likely, SSR markers could be applied to more species within the Cucurbita genus. There were 50.5% SSRs of C. moschata showing polymorphism in C. pepo, whereas only 30.1% of C. pepo SSRs appeared polymorphic in C. moschata. This can, however, also be due to the lower number of tested C. moschata (three) than C. pepo (eight) genotypes. The higher percentage of C. pepo microsatellites, which could be transferred to C. ecuadorensis in comparison to C. moschata (Table 4), implies a closer genetic relationship between C. pepo and C. ecuadorensis than between C. moschata and C. ecuadorensis, which is in line with findings of Sanjur et al. (2002). The transferability of SSRs will be useful for comparative mapping and evolution studies within the genus Cucurbita. The first published C. pepo map, based on the F2 population of O5 × CN, was composed solely of AFLP and RAPD markers (Zraidi et al. 2007). Such markers are useful for map construction of minor crops and in case of limited financial resources. They have the disadvantage of not being transferable to other populations, which greatly limits their application. The reason to update this published map was to create a more saturated and anchored linkage map for C. pepo, using the newly developed SSR markers. First an SSR skeleton map and then a high-density map were constructed. The high information content and transferability of SSRs are decisive for comparative alignment and integration of related maps. AFLP and RAPD markers filled the gaps where SSR markers were poorly represented and often facilitated linkage between unlinked SSR markers. Finally, only nine of the 187 polymorphic SSRs remained unlinked. The present C. pepo map contains 659 loci in total. Marker density thereby increased from 6.9 cM in the published map to 2.9 cM in the present map. However, marker density differs among linkage groups, and there are still two groups (LGp3 and LGp10) containing subgroups, which so far could not be linked. The SSR markers are distributed among all 20 linkage groups, which probably represent the 20 chromosomes of the haploid genome of C. pepo. Twenty-one SSRs in this map (11.2%) have a null allele in one of the mapping parents. SSR markers are generally co-dominant, but the occurrence of null alleles in some genotypes has frequently been reported, for example, by Stachel et al. (2000) in wheat and Billotte et al. (2005) in oil palm (Elaeis guineensis Jacq). Only one of these 21 SSRs remained unlinked in the map. Along with SSRs and two gene loci, six co-dominant SCARs were used to establish the skeleton map. Three (SCAR_1476, SCAR_1484, and SCAR_1490) were converted from RAPD markers and three (SCAR1, SCAR2, and SCAR3) from co-dominant AFLPs by separately cutting out and sequencing the two co-dominant bands. Though AFLP and RAPD markers in most cases are dominant, co-dominant alleles can frequently be detected in both as well. In the previous C. pepo map out of 125 AFLP markers 12 were co-dominant (Zraidi et al. 2007), in this study 17 out of the 105 new AFLP markers turned out to be co-dominant. The low rate of SSRs with distorted segregation (3.7%) was similar to the one found with AFLPs and RAPDs, when creating the first C. pepo map (Zraidi et al. 2007). The SSRs with distorted segregation are all located in different linkage groups. The low level of segregation distortion between O5 (“Lady Godiva”) and CN (the Italian crookneck variety “Bianco Friulano”), found with all three marker types, indicates regular meiosis and very low pre- or post-zygotyic selection between the two parents. Using the same mapping population, the present map, made by JoiMap and containing 659 loci, covers 1,936 cM. Thus it is much shorter than the previous map (2,234 cM) published by Zraidi et al. (2007), which contained only 323 markers, but was constructed by MAPMAKER. Comparable results were reported by Senior et al. (1997) and Vuylsteke et al. (1999) mapping the maize genome. They observed that, despite the larger number of markers, when using JoinMap the lengths of the individual linkage groups were shorter than those constructed by MAPMAKER. The reduction of map length using JoinMap has frequently been reported (Castiglioni et al. 1998; Bradeen et al. 2001; Gosselin et al. 2002; Tani et al. 2003; Pradhan et al. 2003). The inter-specific Cucurbita map, constructed by Brown and Myers (2002) using MAPMAKER, spanning 1,954 cM, comprises only 148 RAPD markers. These observed discrepancies could be due to the difference in the algorithms used by the two mapping softwares. The maximum-likelihood method used by MAPMAKER assumes the absence of crossover interference. However, when interference is present, JoinMap correctly produces shorter maps, even though both programs use the Kosambi mapping function (Stam 1993). Due to this difference, JoinMap will usually produce shorter maps than MAPMAKER, even using the same data set and same settings (Liebhard et al. 2003). As a consequence, genome length (Ge) estimate by the methods of Hulbert et al. (1988) is also influenced by mapping software. In a pedigree of Sugi (Cryptomeria japonica) Ge was 2,168.5 cM according to MAPMAKER and 1,632.4 cM according to JoinMap (Tani et al. 2003). However, the observed map coverage (Co) is less affected by the mapping software, because Co is defined as the ratio of the observed length of the map (Gof) and the estimated genome length (Ge) (Cervera et al. 2001). The Co of 86.8%, as calculated in this work, is very high. Cardle et al. (2000) and Morgante et al. (2002) reported that microsatellites are preferentially associated with the nonrepetitive fraction of plant genomes. In Arabidopsis thaliana, AG/CT SSRs occur significantly more frequently in transcribed regions and 5′UTRs than in introns and 3′UTRs (Morgante et al. 2002). Moreover, sequence analysis of DNA contigs in wheat and barley has shown the presence of clusters of closely linked genes forming gene islands that are separated by large stretches of repetitive DNA (Wicker et al. 2001, 2005; Varshney et al. 2006). Homozygous regions between mapping parents may lead to gaps and insufficient coverage in the map. The development of SSR markers from genomic DNA affects their distribution on the linkage maps. Ramsay et al. (1999) reported that SSRs isolated from genomic DNA libraries tend to concentrate in retrotransposons and dispersed repetitive-element DNA. All the SSRs in this research were developed from genomic libraries. When more ESTs will be available in Cucurbita they might improve the distribution of SSRs in the current map. In Austria, C. pepo has been cultivated for centuries primarily for seed oil production (Teppner 2000). A special feature of Austrian oil-pumpkin varieties is the completely hull-less seed coat (Teppner 2000; Zraidi et al. 2003), which is controlled by a recessive major gene, h (hull-less seed) (Schöniger 1950). Four SSR loci were found 1.5–3.6 cM from the hull-less locus (h) in LGp9. SSR markers closely linked to h would in the future be useful for map-based cloning of the gene responsible for testa lignification in Cucurbita. Cultivars with bush growth habit would increase the productivity in limited planting areas, so this is an important economical trait. The SSR marker CMTp131 in linkage group LGp12 was 7.8 cM from the bush locus (B). In a back-cross breeding program for more than one trait, for example, combining hull-less seeds and bush growth habit, this marker could be very useful. A saturated linkage map with entire genome coverage allows broad applications of molecular markers in plant breeding. Increasing marker density can easily be accomplished by using different mapping populations that segregate for important agronomic traits and harbor enough polymorphic SSR markers. Due to the good transferability between species and high reproducibility of SSR markers, they can easily be applied for map integration across different Cucurbita species, whose genetic variation can be utilized for breeding. The transferability of Cucurbita SSRs to Cucumis still awaits investigation. In conclusion, we developed 500 microsatellite markers from SSR-enriched genomic libraries. They show a high transferability among species within the genus Cucurbita. The first C. pepo consensus map (Zraidi et al. 2007) has been updated by 178 SSR and new AFLP markers. The updated map contains 20 linkage groups with a map density of 2.9 cM. Four SSRs were detected to be linked to locus h (hull-less seed trait) and one SSR to locus B (bush growth habit). The primer sequences for the 500 SSRs and the updated C. pepo map with 659 loci are available as supplementary information. This research was financially supported by the Austrian Science Fund (FWF Project, No. P19662-B16) and by the State of Lower Austria. Thanks are due to Dr. Bodo Trognitz ARCS, Seibersdorf Austria, for his support in creating the maps. We are grateful to J.E. Staub, USDA–ARS and University of Wisconsin, Madison, for critically reading the manuscript and Dr. Helga Danhorn for her editorial help.